“No restaurant does a better job of making personal and revelatory the experience of spending hundreds and hundreds of dollars on food and drink.” – Sam Sifton, NYTimes restaurant critic. 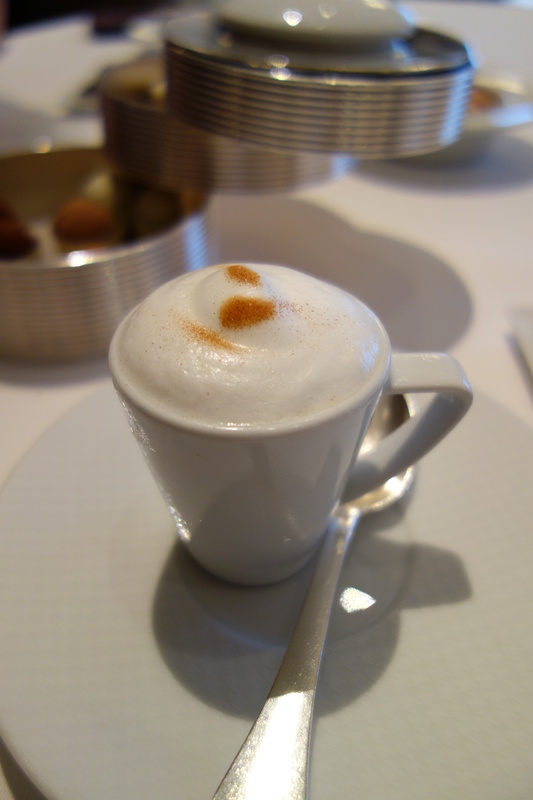 It is hard to know what to write about per se. 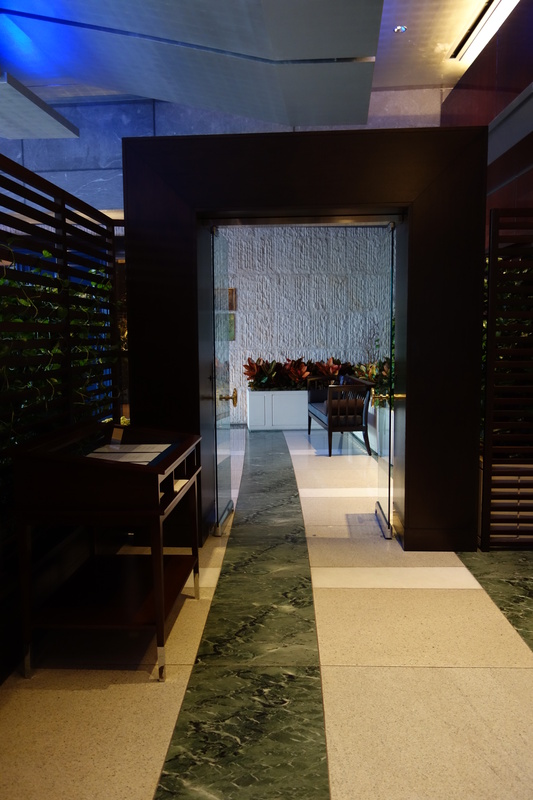 In its 9 years of existence, it has become a destination restaurant, occupying pride of place in American opulence and luxury. 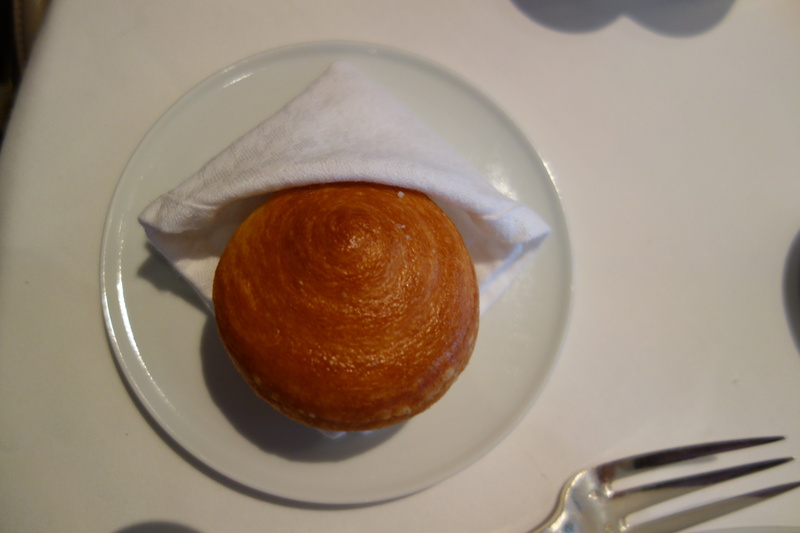 Many eat at per se because it is widely considered to be the best restaurant in New York and probably America (a toss-up with the usual suspects: The French Laundry, Saison, Alinea, or Eleven Madison Park etc. 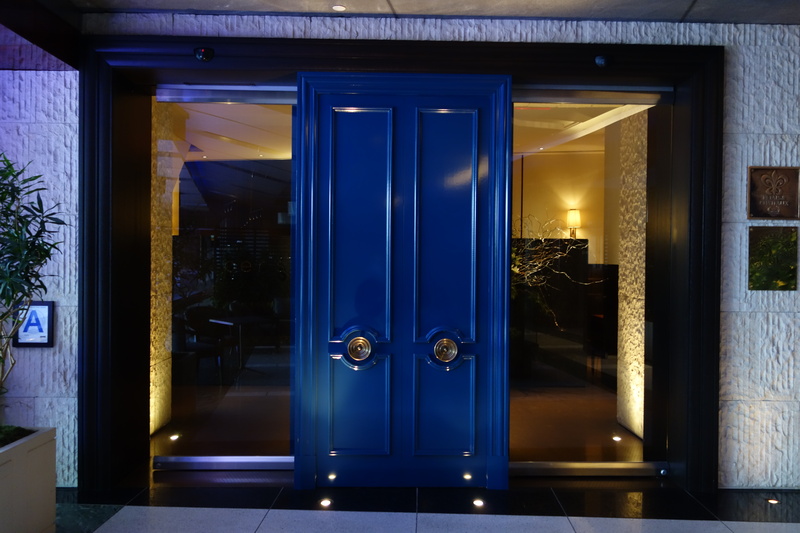 ), and making a reservation is moderately hard. 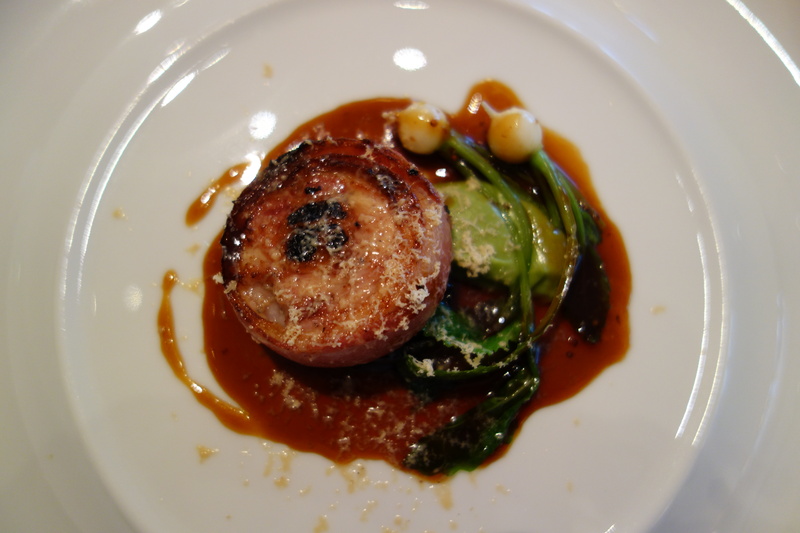 A meal at per se doubles as a positional good – off the top of my head, I remember incidental mentions of per se in anecdotes about dating Goldman VPs on Wall Street Oasis, dating memoirs like Data: A Love Story, and tell-all memoirs. But it remains about food at last count. 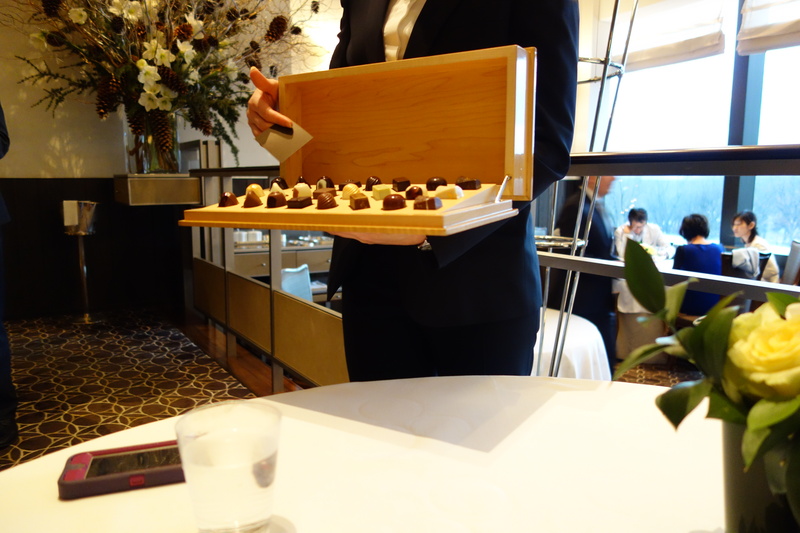 I heard from many repeat diners that the best experience at Per Se is the extended tasting menu. 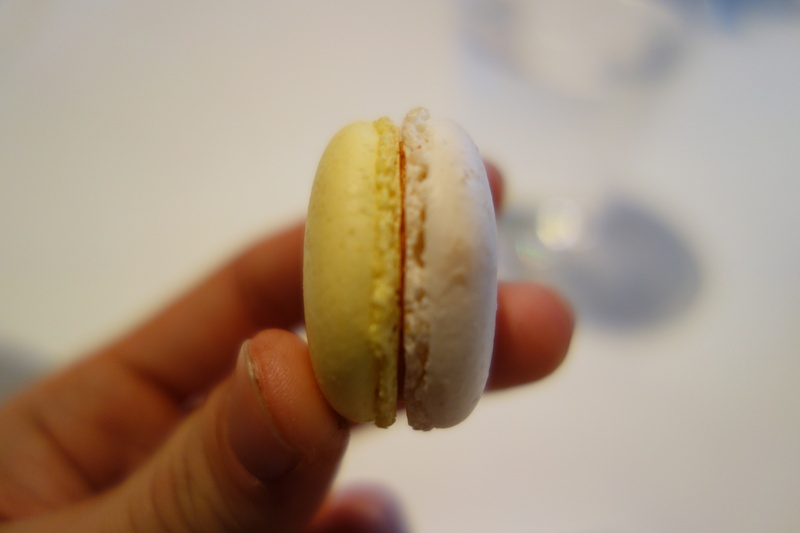 Taking a cue from the genius Oscar Wilde, who is purported to have said: “I have the simplest tastes. 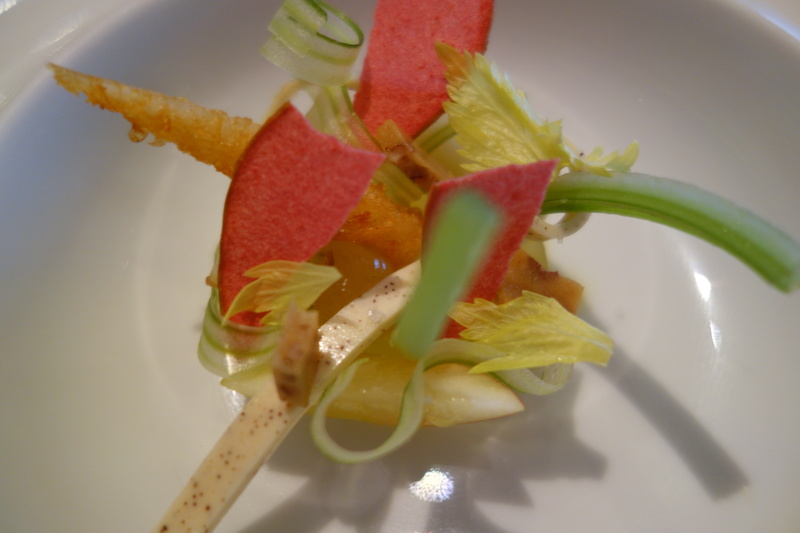 I am always satisfied with the best”, my confederate and I booked our extended tasting menu for early December. 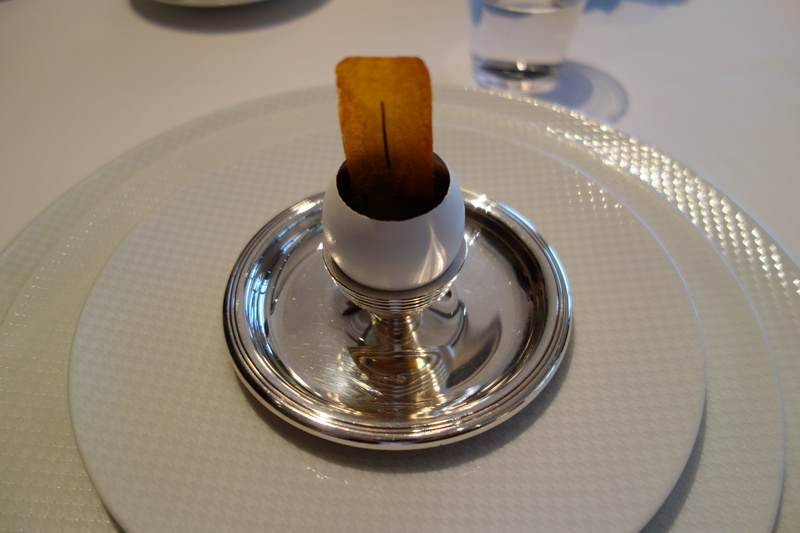 The cooking at per se, in characterised by re-interpretations jumping off of familiar foods. The salmon cornets are like ice cream cones. A fine tartare of salmon now brings to my my mind shaved ice. 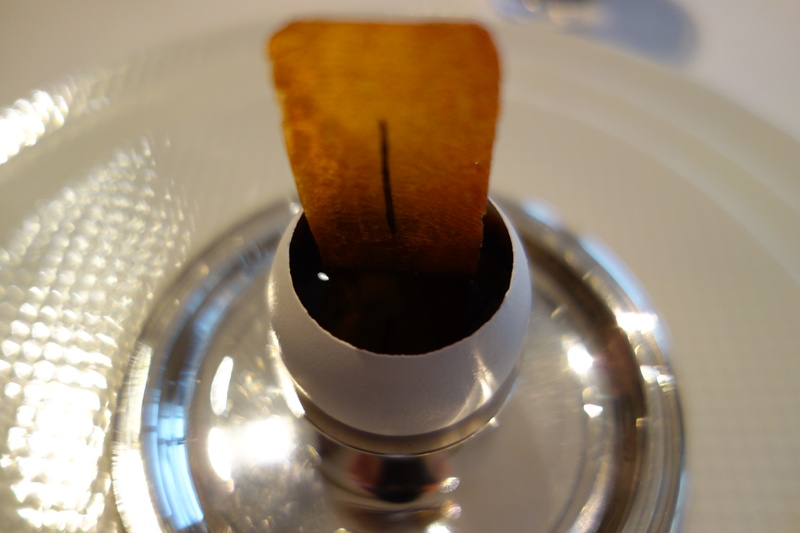 A wrapped hard tuile contained a tangy and spicy red onion creme-fraiche. 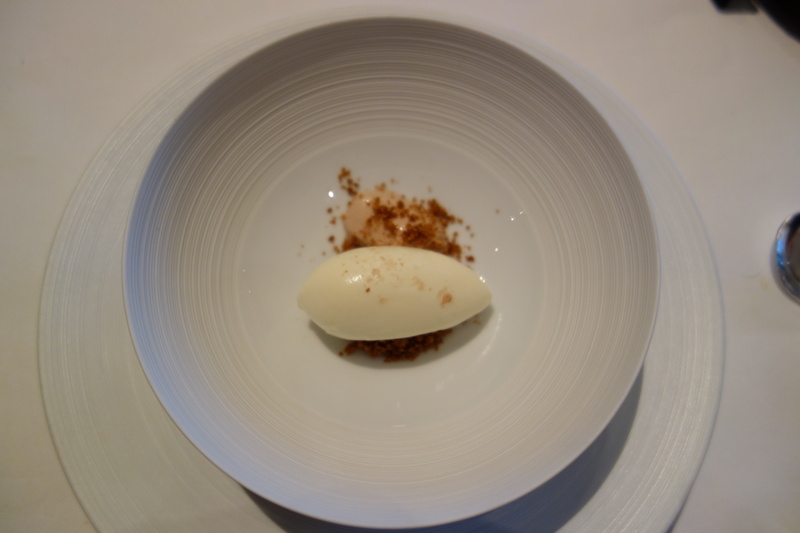 The creme fraiche tasted like the remainder of ice-cream in an ice cream cone of a Walls Cornetto. Perfect. One woman’s successful attempt to replicate the salmon cornets. 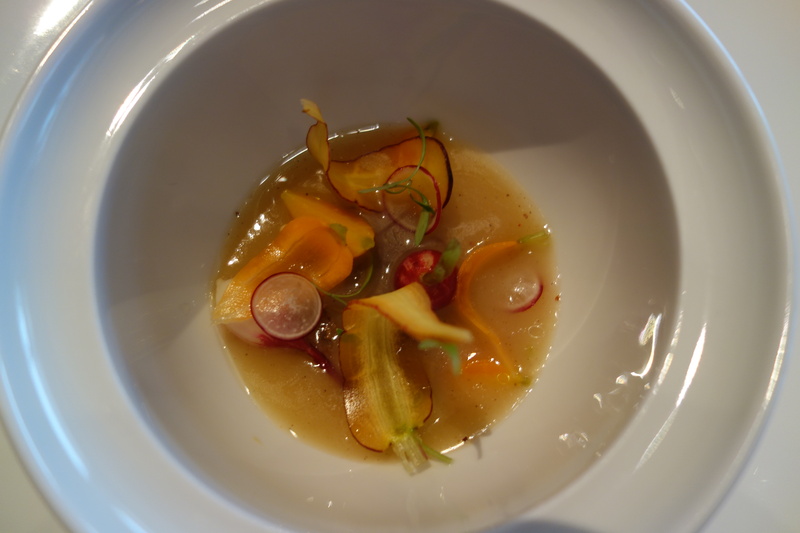 The dashi was incredible, a thick savory meal-in-itself. 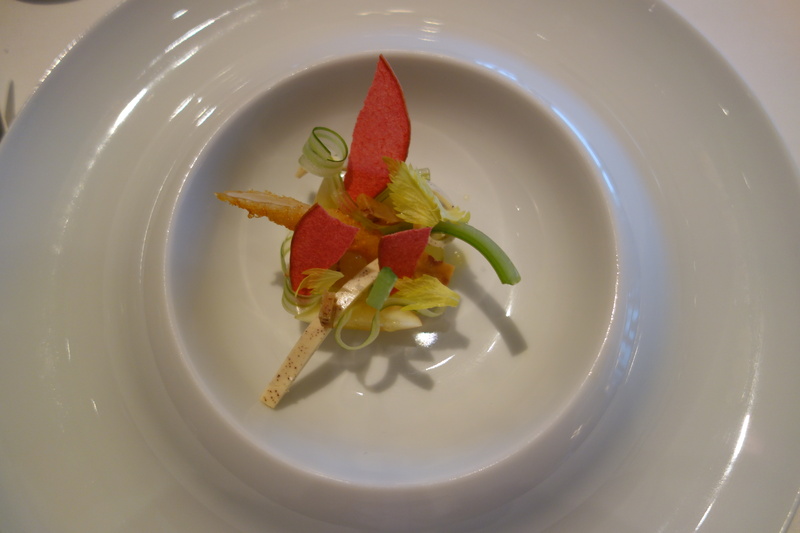 A mini hockey puck of fried soba, served drowned in soup, seemed to me like haute ramen. 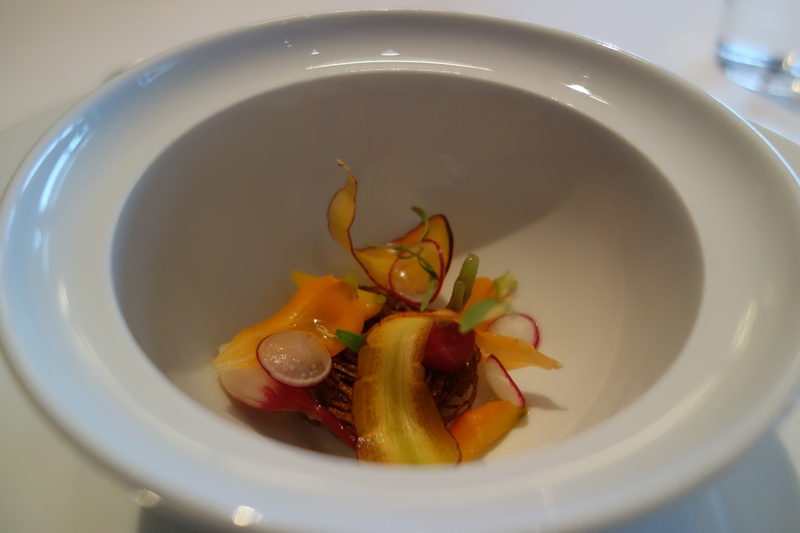 The lightly pickled carrots added an organic resistance to the tongue, playing with textures from thin-crisp noodles, pickles and vegetables, and soup, though it added little tastewise. 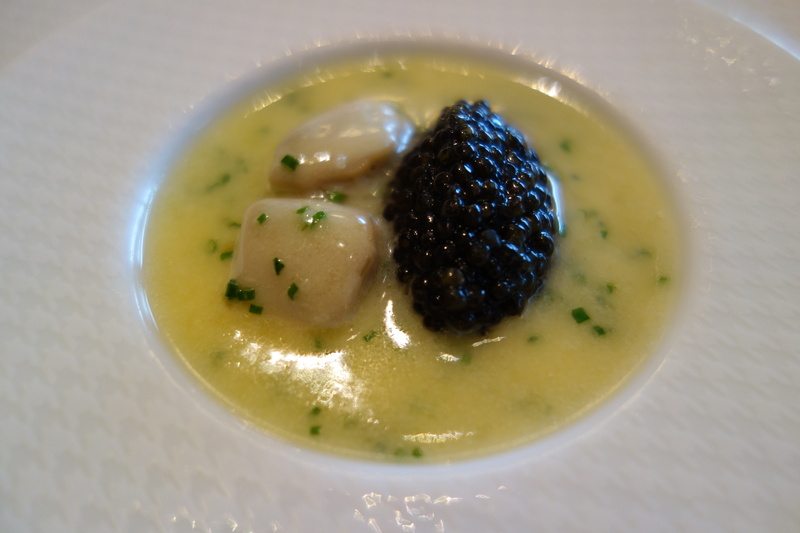 Per Se’s famed “oysters and pearls” can be described in one of two ways: 1) sour cream and onion chips from the ocean, or 2) chicken and dumplings made with seawater. It’s just not what you’d expect, at every level. 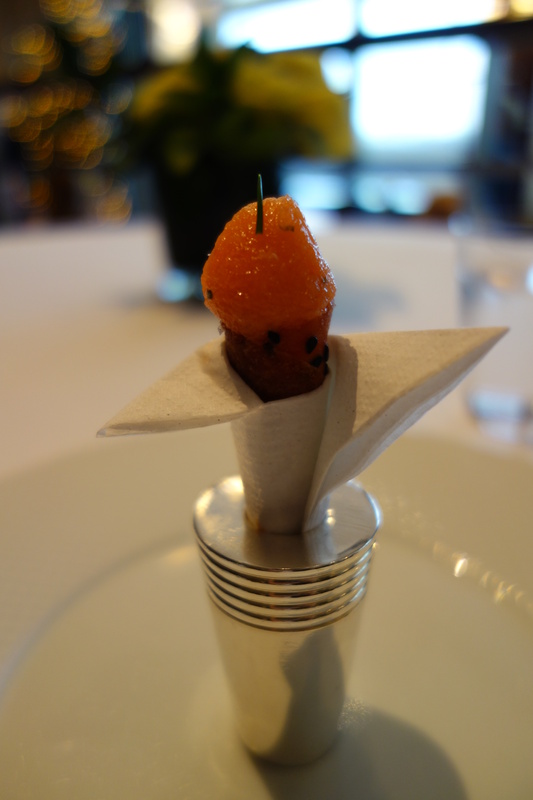 The caviar doesn’t pop in your mouth like salmon roe does, nor does it get stuck in your teeth like flying fish roe does; you wouldn’t know you were eating it if it wasn’t for the saline taste. The oysters, tiny to begin with, fall apart in your mouth at the slightest notion from your teeth. It seems as if the texture of the tapioca would be too similar to that of the roe, but it really adds to the sense that you’re just eating a dish of mama’s creamy dumplings. 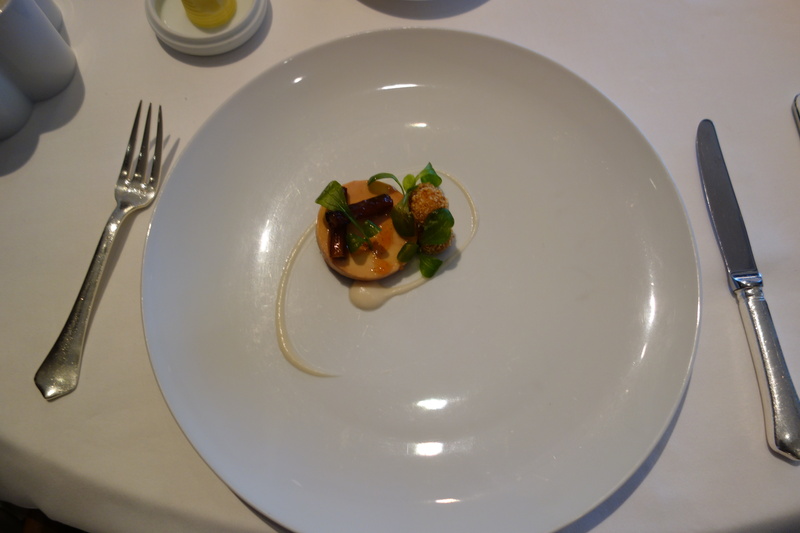 I was not a big fan of this dish. 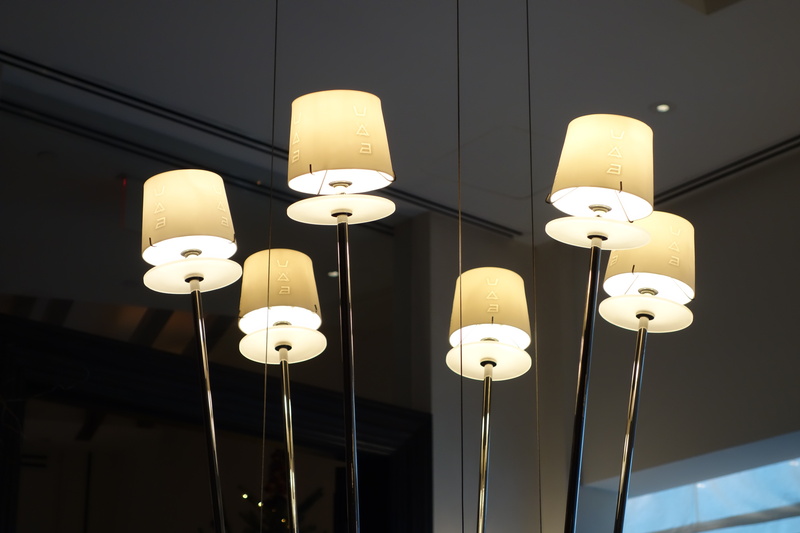 The textures vanished into sameness. I’ve eaten quite a few Island Creek oysters, and the beauty of an Island Creek is the plump crunch of a saline fruit, just reserved enough in its salinity to not be overpowering. 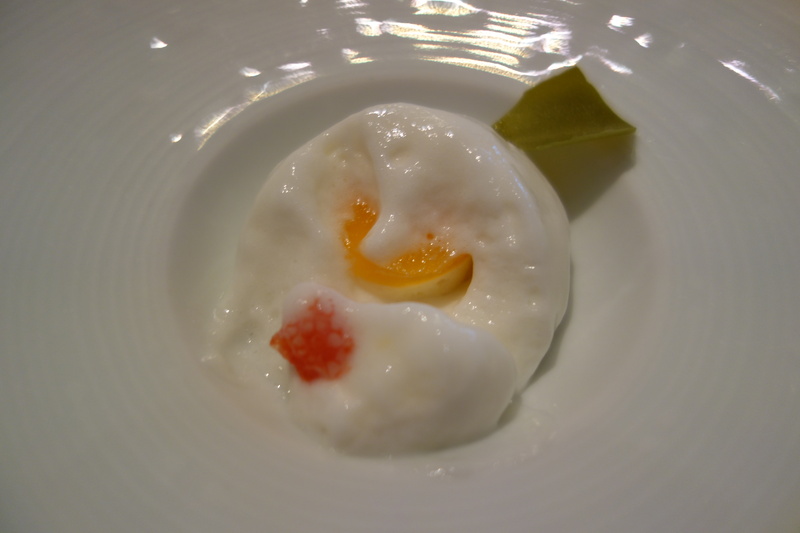 The baby oysters were stripped of the oyster frills, and did not have the plump crunch, instead defining a general region of fruity saltiness. 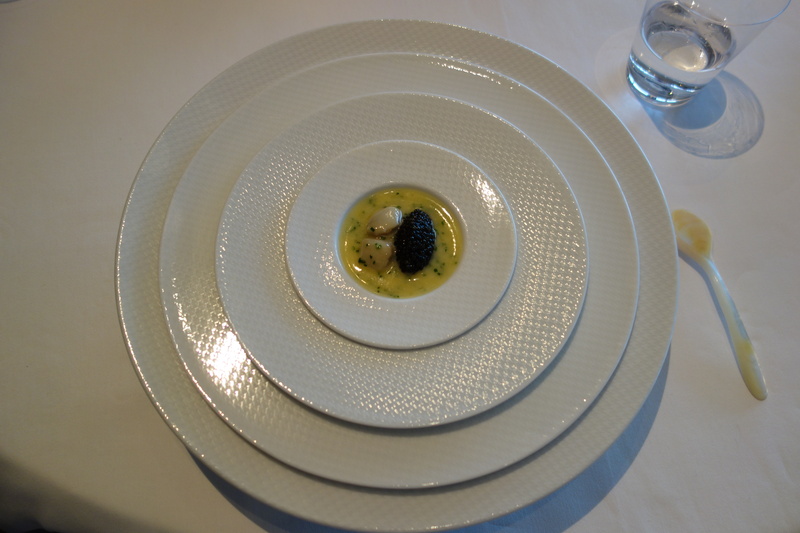 The caviar likewise did not have any resistance. 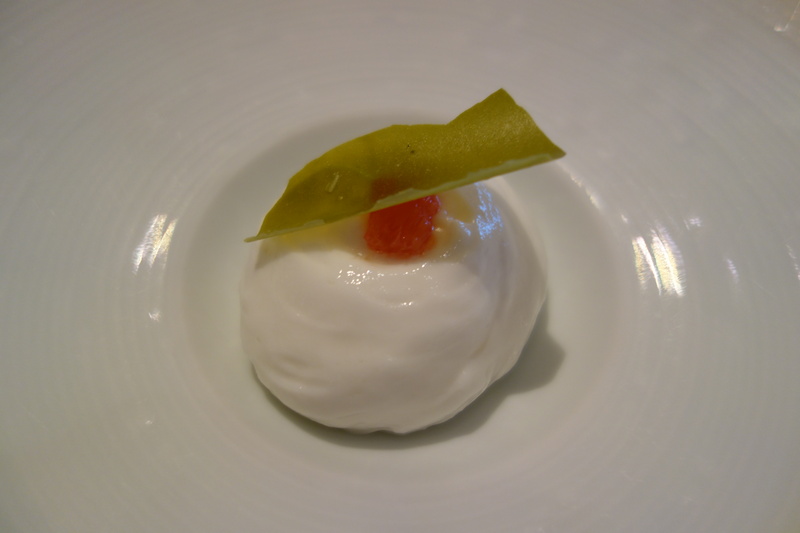 The hot sabayon concealed some sticky tapioca pearls – and I felt I was eating a general mass of salt, cream, and carbs. 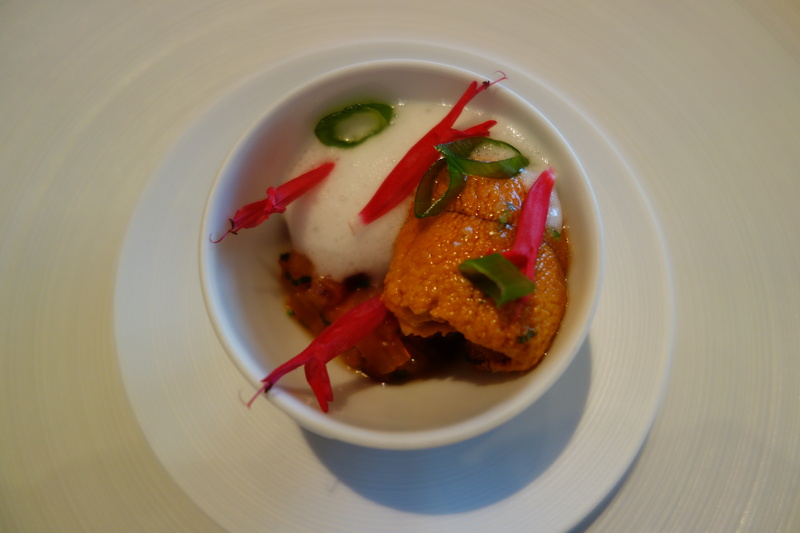 A large sensually folded tongue of crunchy uni was sprinkled with lime salt. and decorated with red lamp-shaped blossoms of pineapple sage. 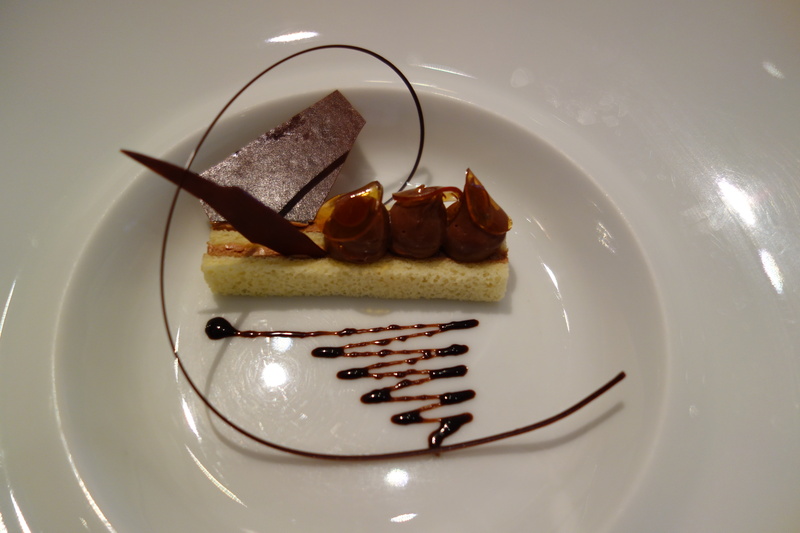 If we were to stop here, the dish would be a spectacular indulgence. 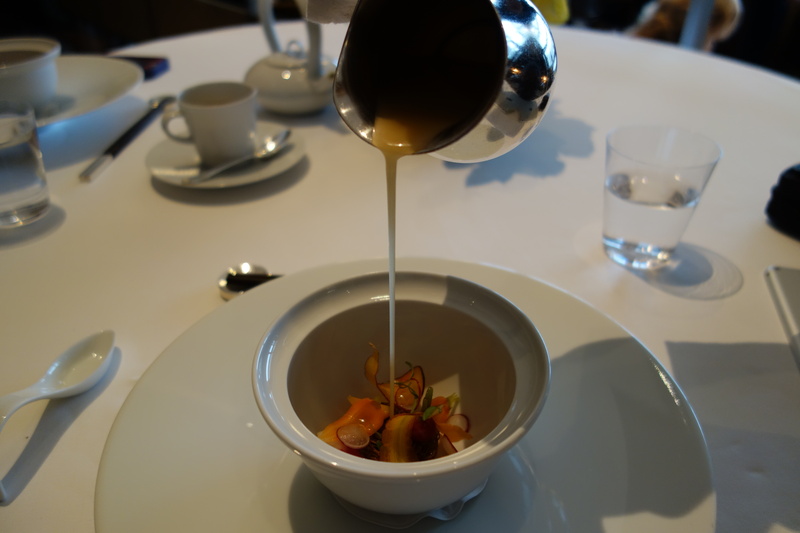 Further down the bowl, a ragout of persimmons and bacon sat in a yuzu sauce, which was sweet, and tasted like a Chinese sweet sauce. The cubes of bacon coated in sweet sauce added little to the dish. 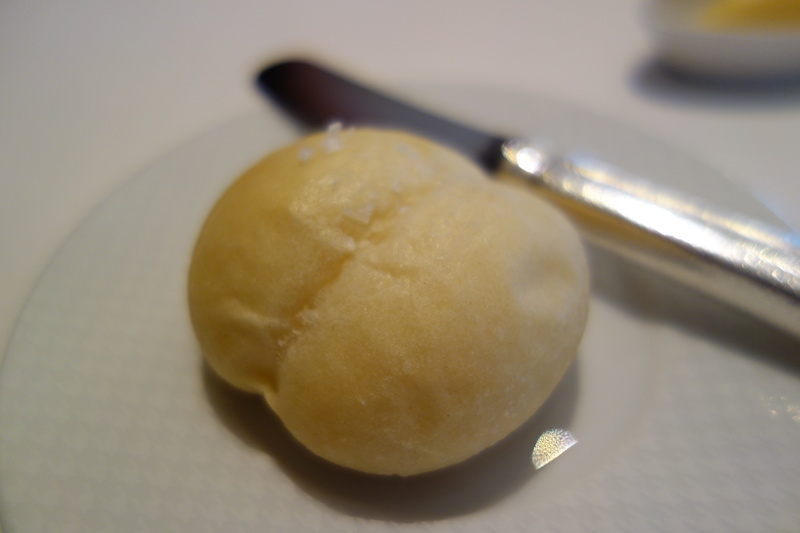 A white truffle-infused custard with a black truffle sauce on top. Rich and decadent. 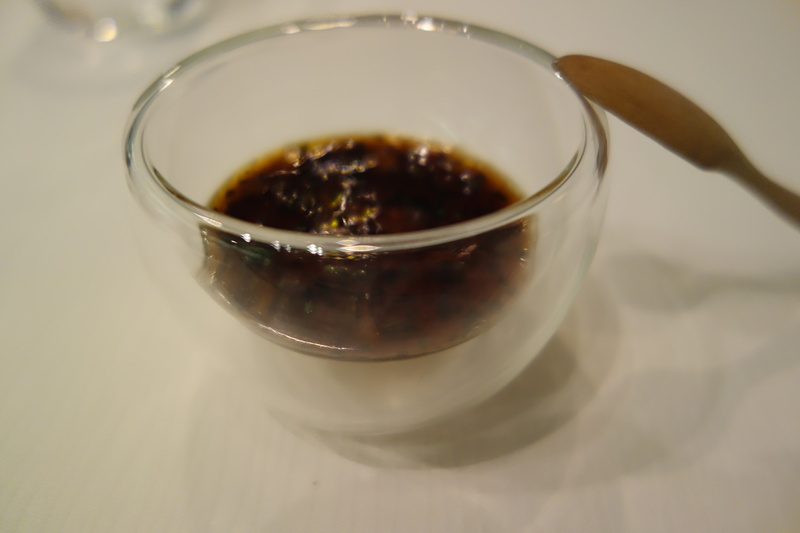 Very similar to a dish called “Warm Foie Gras Jelly with Perigord Black Truffle Coulis” served in Singapore’s Restaurant Andre. 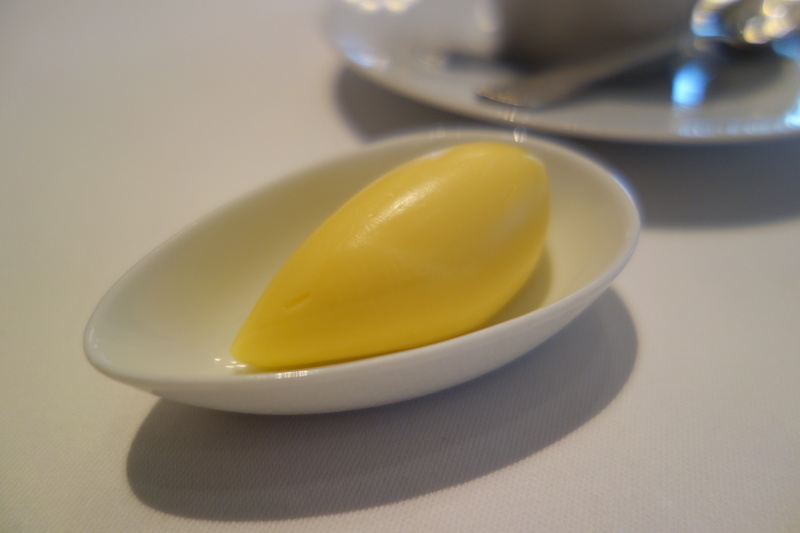 I prefer Restaurant Andre’s version slightly, since he uses foie gras instead of custard, and has this terrific skin between the back truffle sauce and the custard. 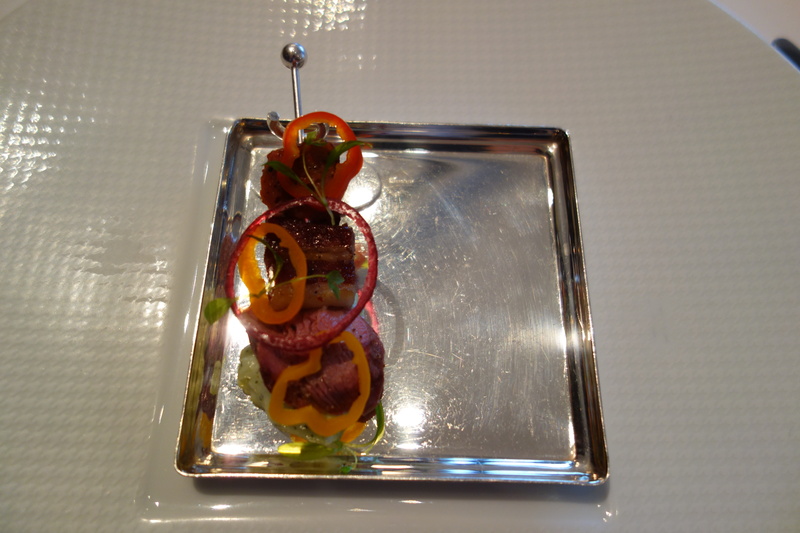 A high-end lamb kebab. A raita is a yoghurt dipping sauce, and here was made with cucumbers (underneath the kebab). Good. 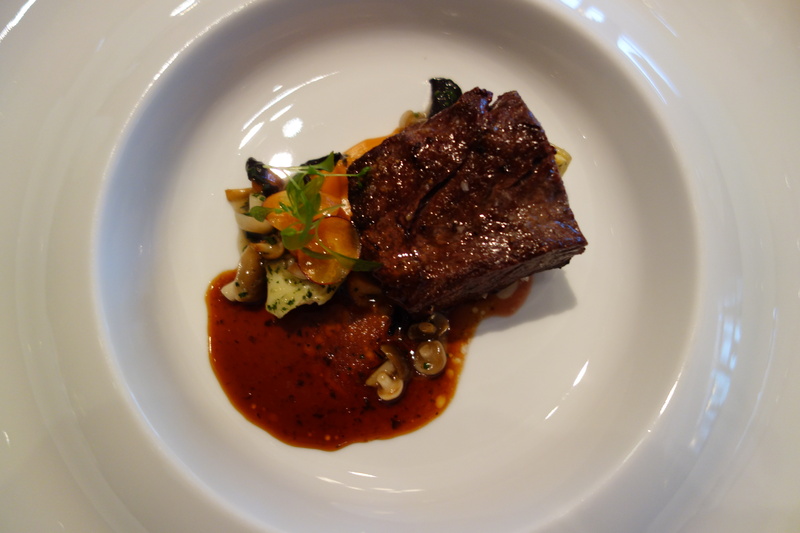 Lamb is from Thomas Keller’s farm in Pennsylvania. The apples were delicious, I could have had them as apple chips any day. 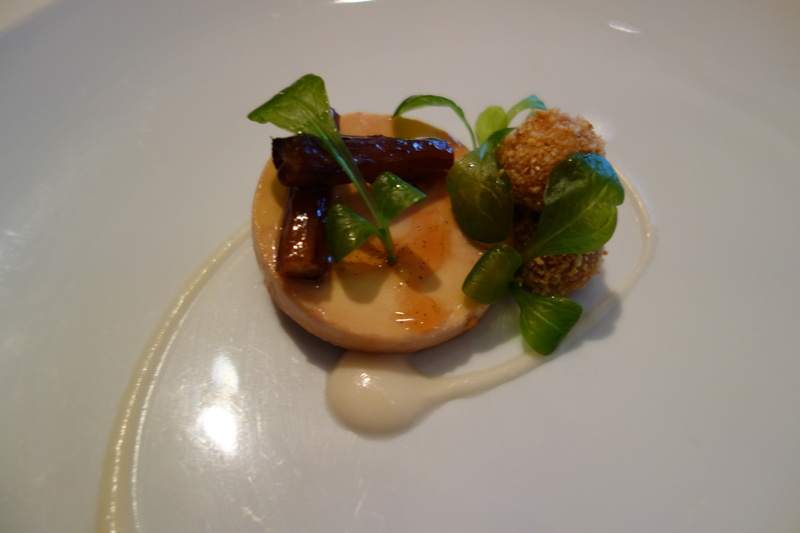 The peppercorn custard (mignonette), celery and crisp salsify supported the main player – apple. I enjoyed this dish very much. 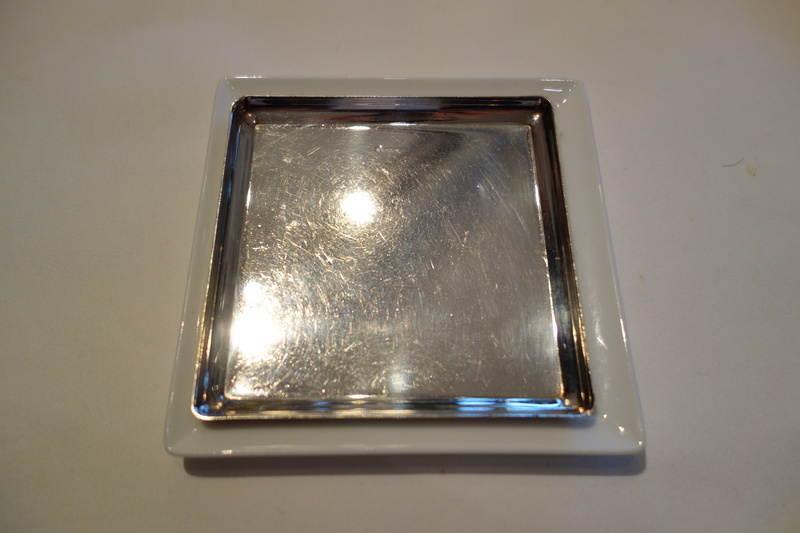 A self-service dish, the “blank canvas” of foie gras terrine tasted like the Ferrero Rocher candy, thanks to the hazelnut sauce. 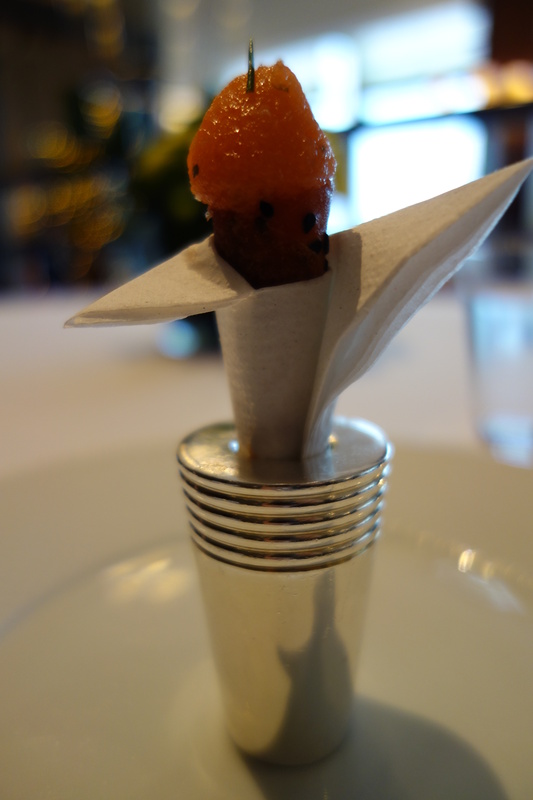 Bananas Parisienne and Caramelised Salsify were good little snack-canapes. 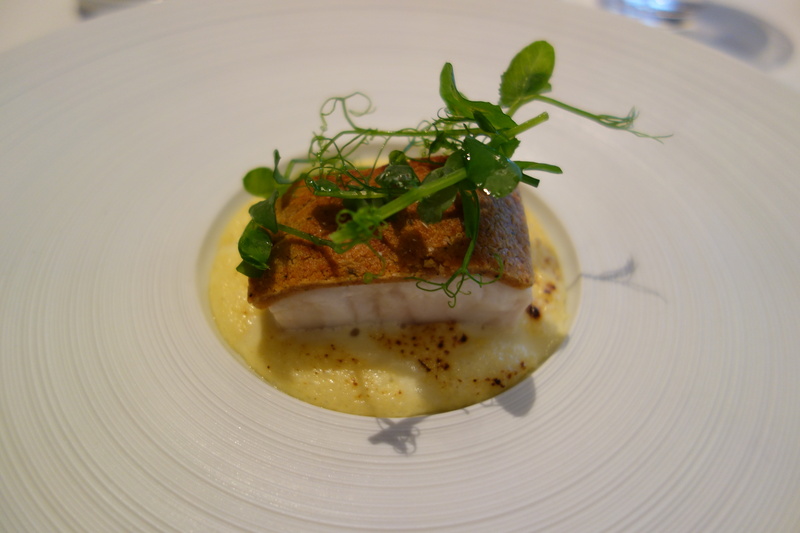 The sturgeon was a tender steak, and covered with a pie crust like covering. I wasn’t a fan of the sturgeon because I don’t like sturgeon that much. 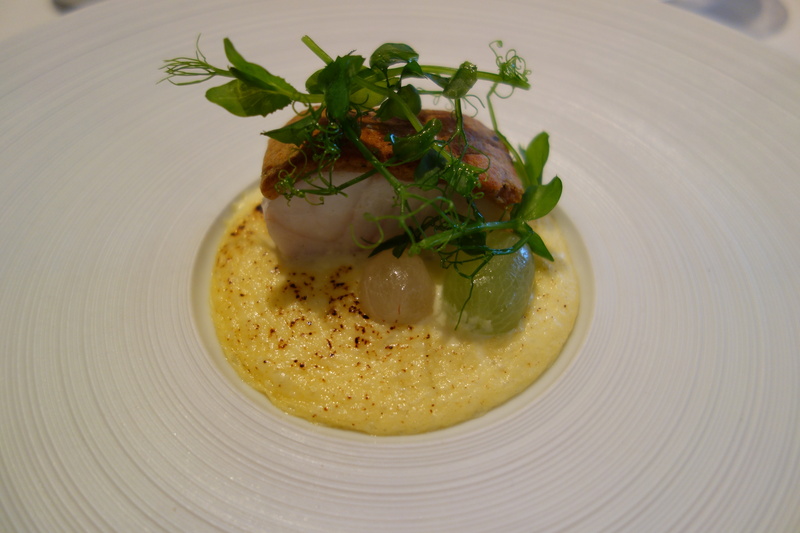 So this dish attained a local maxima (in the neighborhood of sturgeon) for fish enjoyment, but was not a global maxima of fish enjoyment (which for me in this style, would be cod. 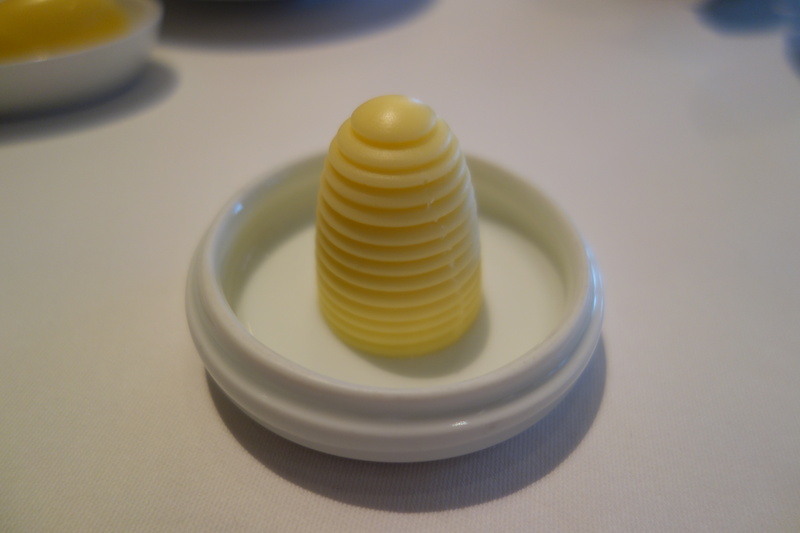 The sauce was an amazing thick sabayon-looking sauce that tasted of half notes of honey and sour tang. A tremendous Sauce Veronique. The first unanimously great main of the meal. 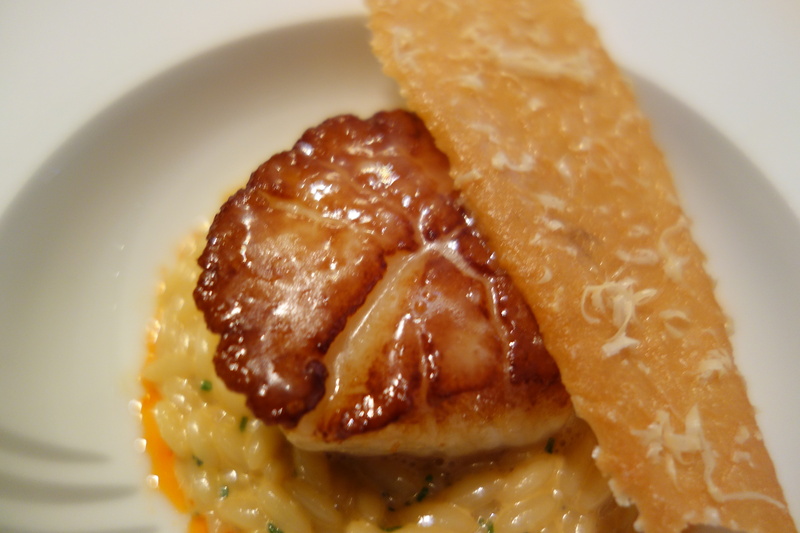 Usually, as our server explained, Mac and Cheese is prepared with lobster – but since they had amazing scallops, the kitchen decided to cook down the lobster with vermouth into a broth, and then infuse the risotto-looking orzo pasta with the broth and mascarpone. 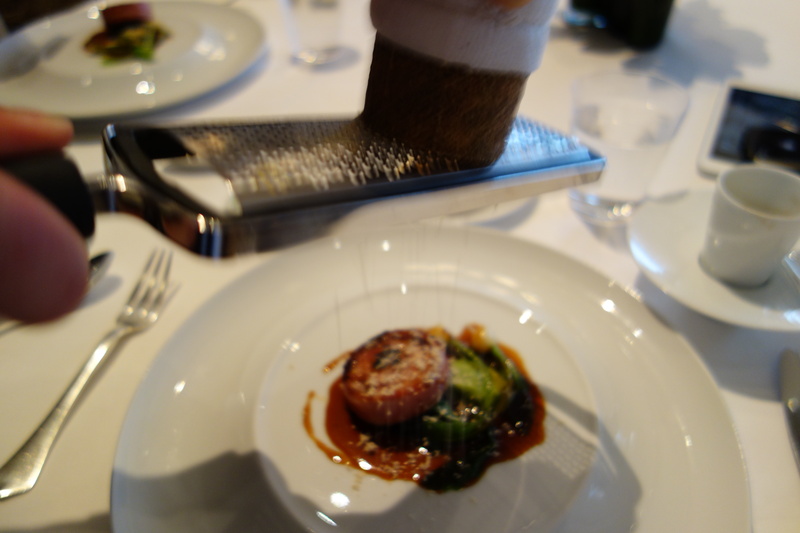 Lobster roe was crushed to provide the red oil at the side of the plates. Although we were not regulars enough to get the in-joke, we appreciated the thoughtfulness that went into this dish, especially the sacrificial lobsters. 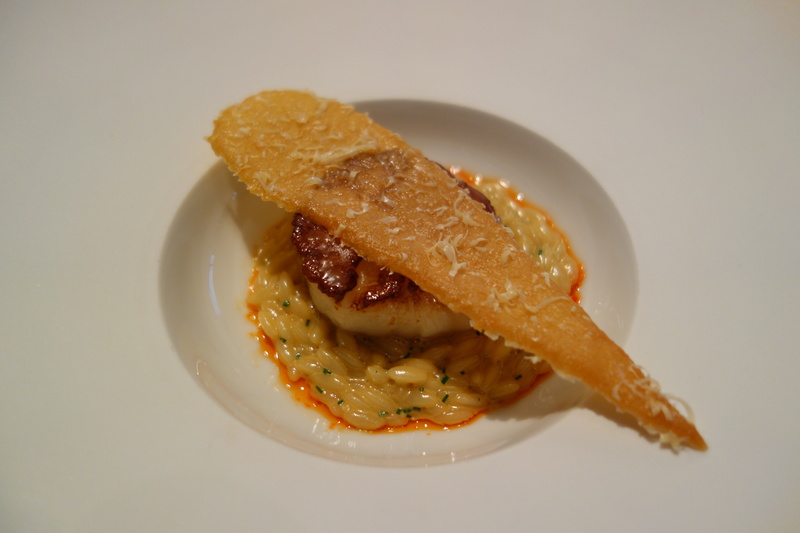 The scallop was perfectly seared, and a parmesan tuille garnished the dish. 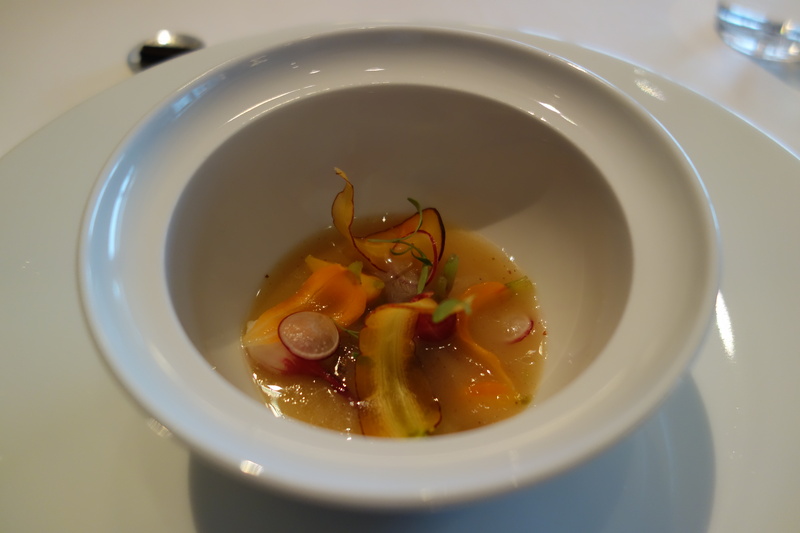 As an aside, this dish reminded me of the laksa dish in Singapore (a form of curry noodle). 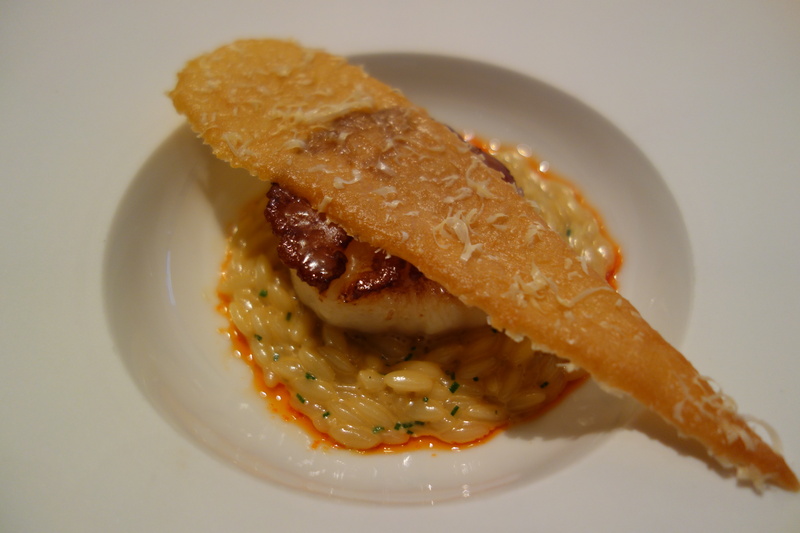 The subtle sweetness of lobster reminded me of coconut milk, the scallop reminded me of the seafood that goes into the broth, and the orzo were of similar texture to the rice noodles commonly found it laksa. Tremendous. 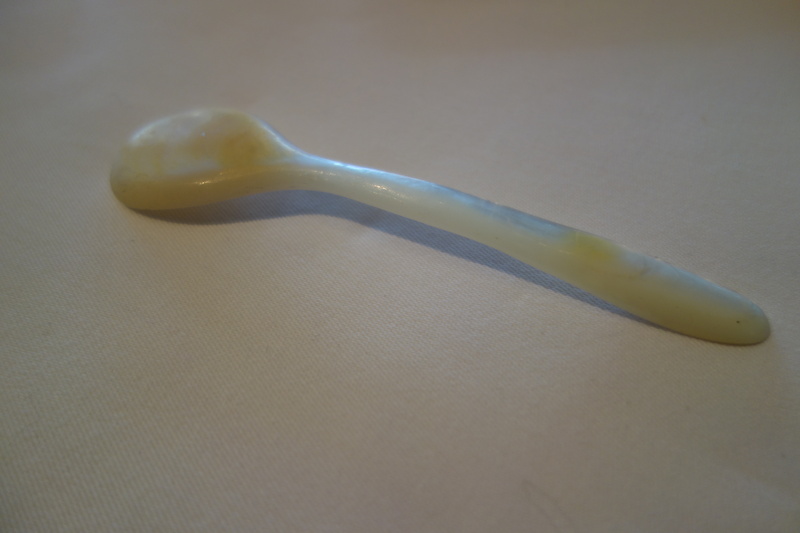 One of the peaks of the meal. 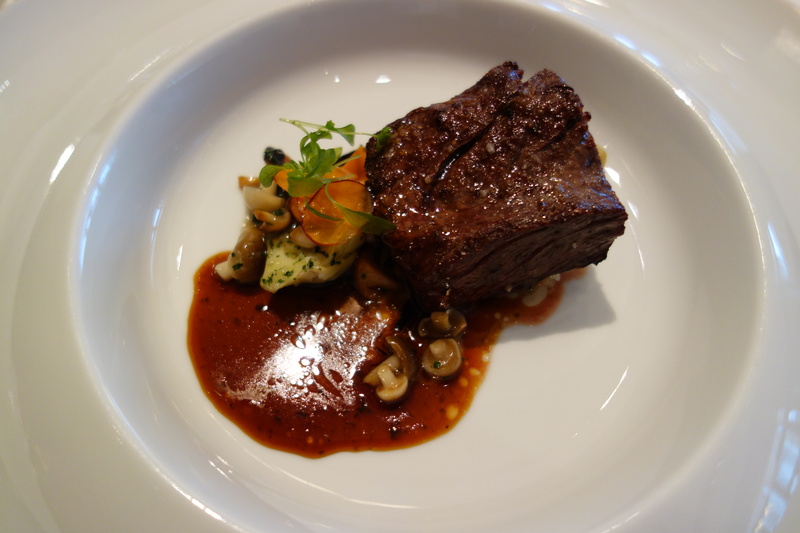 An uncommon cut of beef, the “calotte de boeuf” is the part wrapped around the rib-eye that is commonly sacrificed for filet mignon. It has higher marbling. 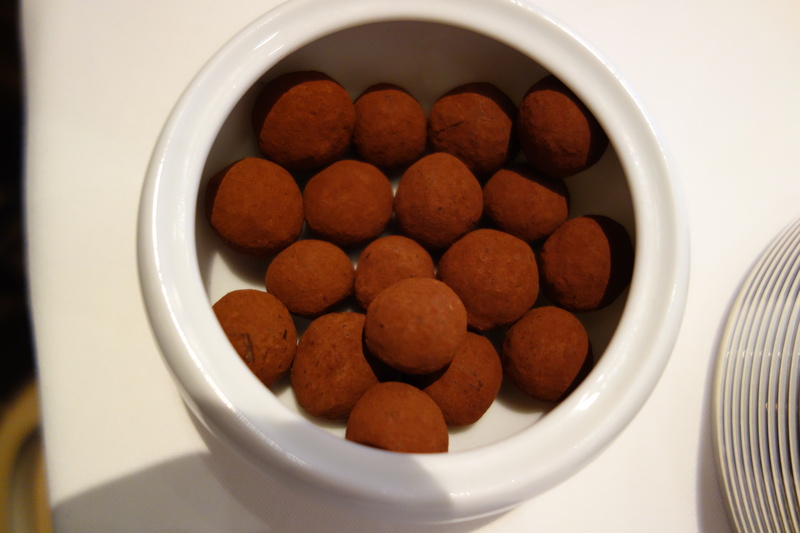 Excellent paired with uncommonly smooth carrot puree – the carrots had first been roasted to bring out their sweetness, then pureed and sieved, and then infused with butter. Deliciously sweet onions and compression made another entrance (this time for pear). 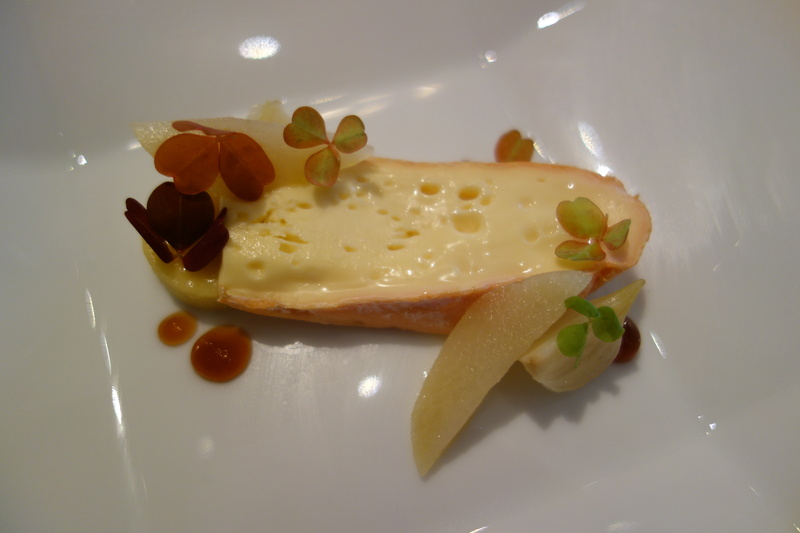 Creamy and ripe, a beautiful cheese course. Traffic light! Yes, I still play with my food. When I was a smaller child, I ate a lot of lime popsicles, the sorts with a green frozen covering and a sweet milk core. 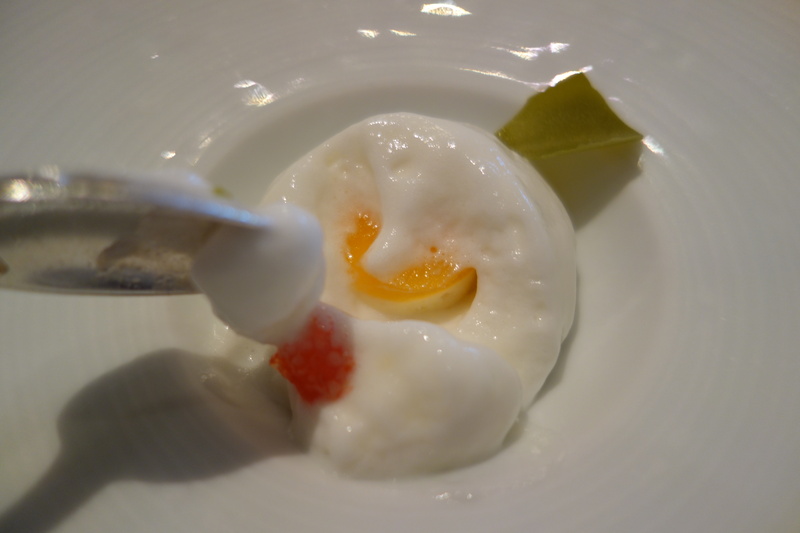 The interface region between lime and milk would be a magical transition between the sourness of lime and the sweetness of the milk core. 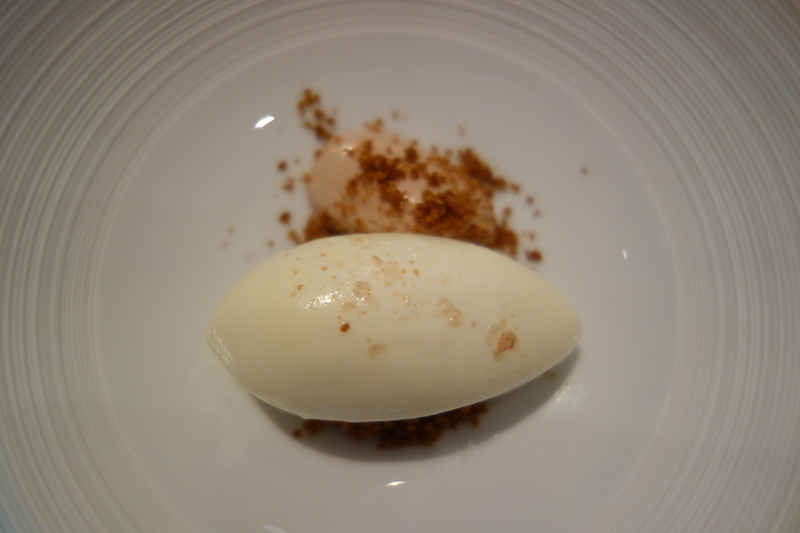 The buttermilk ice-cream tasted like that interface region to me, a taste I love. Another trip down memory lane. 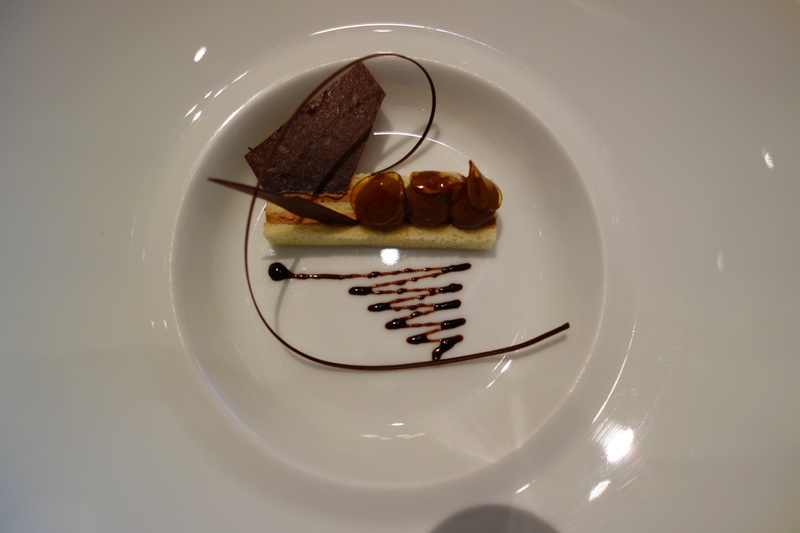 Quite decent, but I’m almost completely jaded of chocolate desserts, unless it’s bloody amazing. 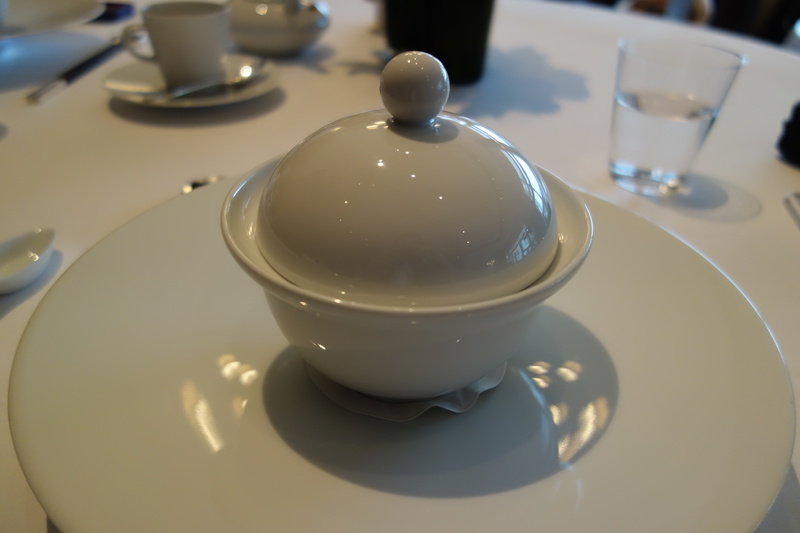 My first impression of per se under Eli Kaimeh is that the kitchen is a master of the miniature, perfecting dishes over the course of many years. 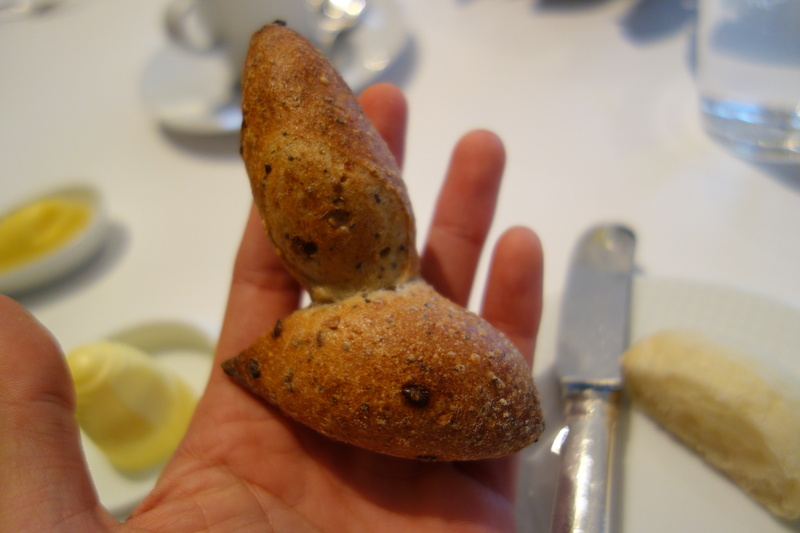 The embarrassment of riches in per se reviews all over the food-blogosphere is testament to its status as the top destination restaurant in New York. 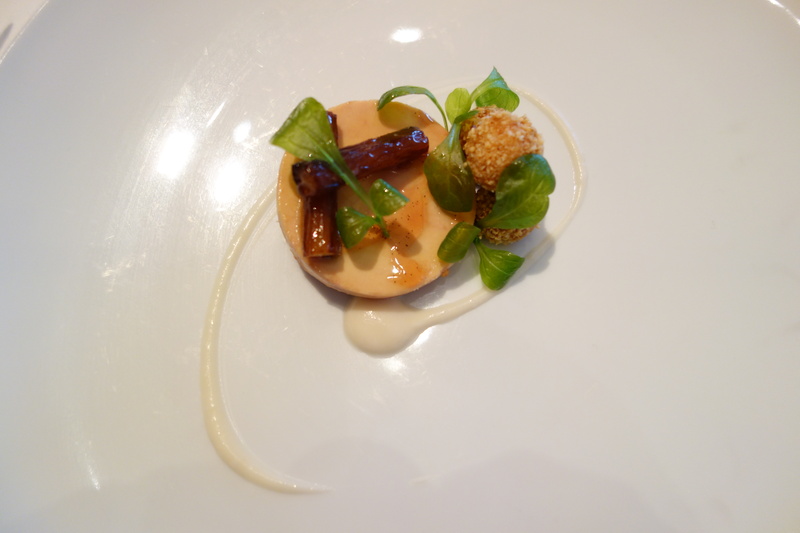 The French Laundry/per se canon has solidified over the last 2 decades. The flip-side of perfection is conservatism. The trade-off seems to be between technical perfection and spontaneity. When the kitchen perfects, it mostly loses its adventurous spirit. 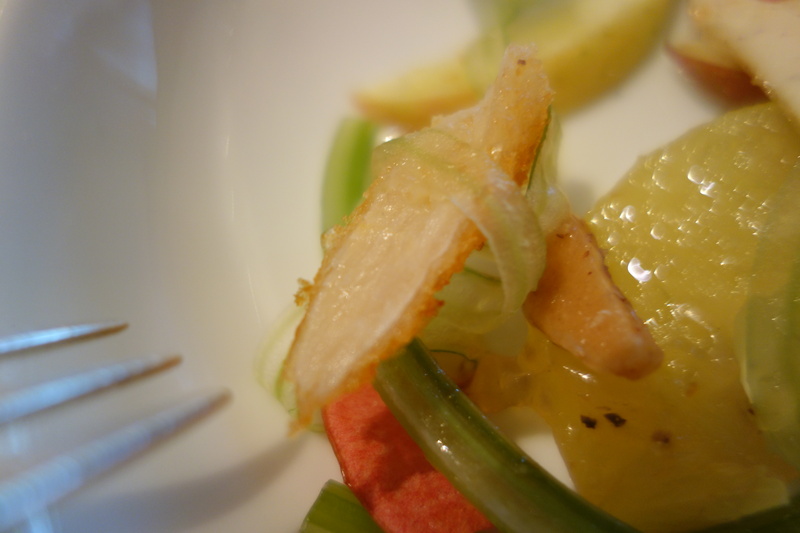 Most of the very good dishes didn’t set my pulse racing. 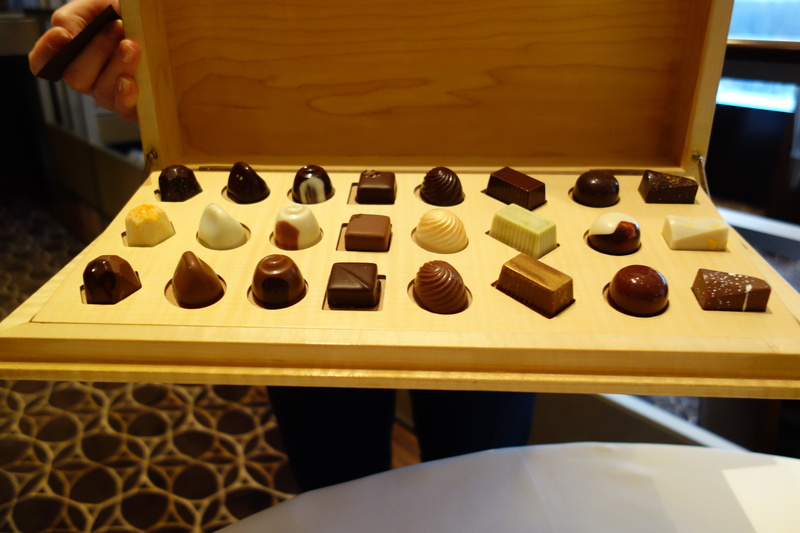 “That was the moment I knew I had to leave the French Laundry. – Grant Achatz (chef of Alinea), Life on the Line, relating an anecdote about trying to bring el Bulli ideas to the French Laundry. 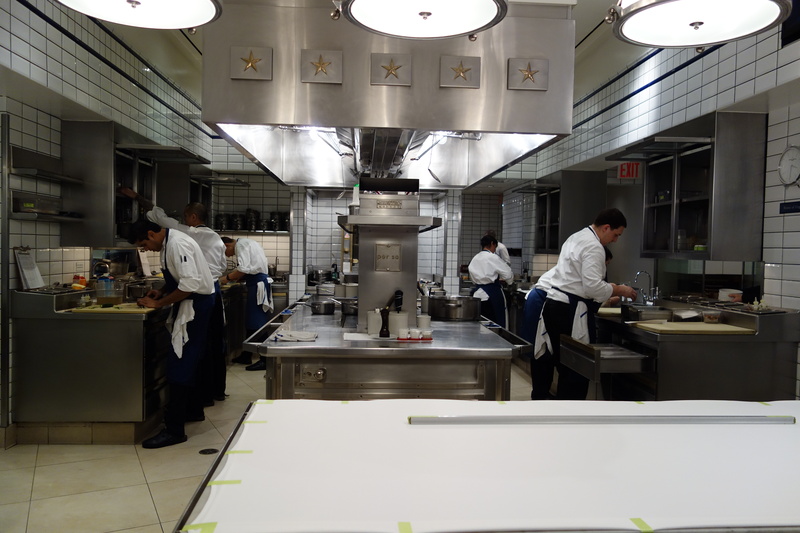 For $600++ per person, I expected to be blown away by much more than I actually was, and I did not love it as much as I did Eleven Madison Park in November. 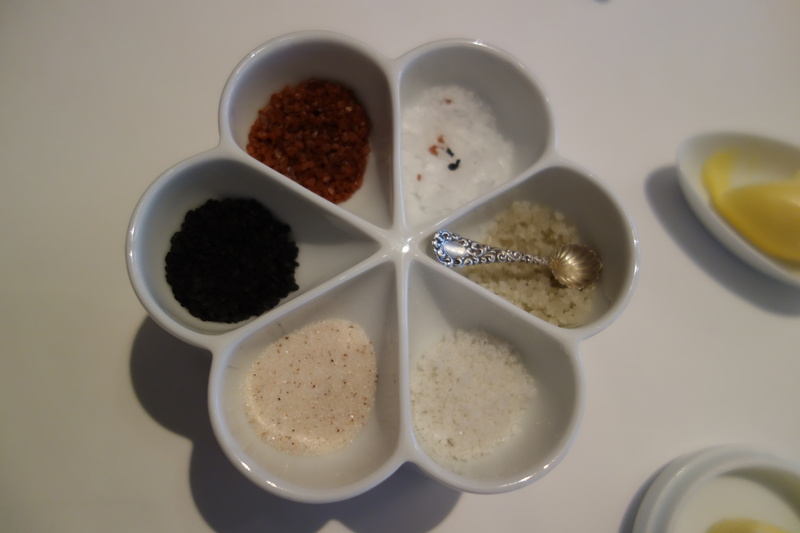 I like restaurants that takes risks, that introduce new flavour combinations and more modernist techniques. 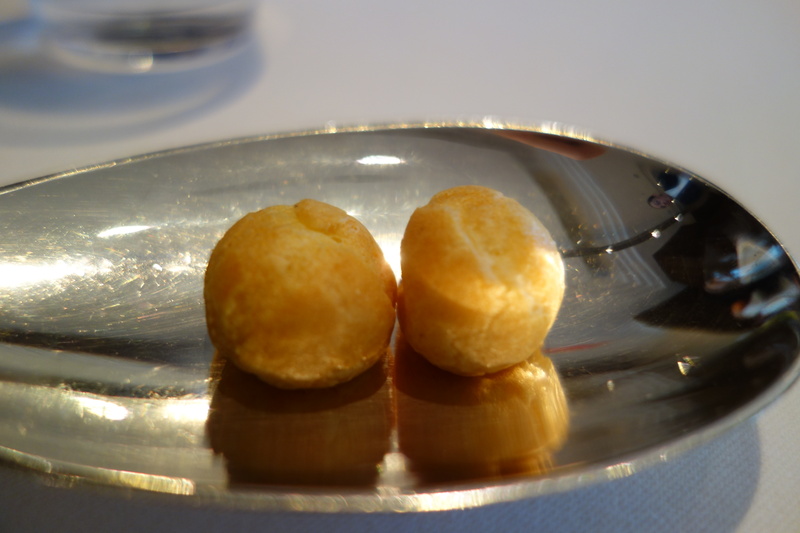 per se’s food is elegant, but a bit sterile. Thanks for linking to my review! I’m really disappointed that you weren’t bowled over by the meal, though. 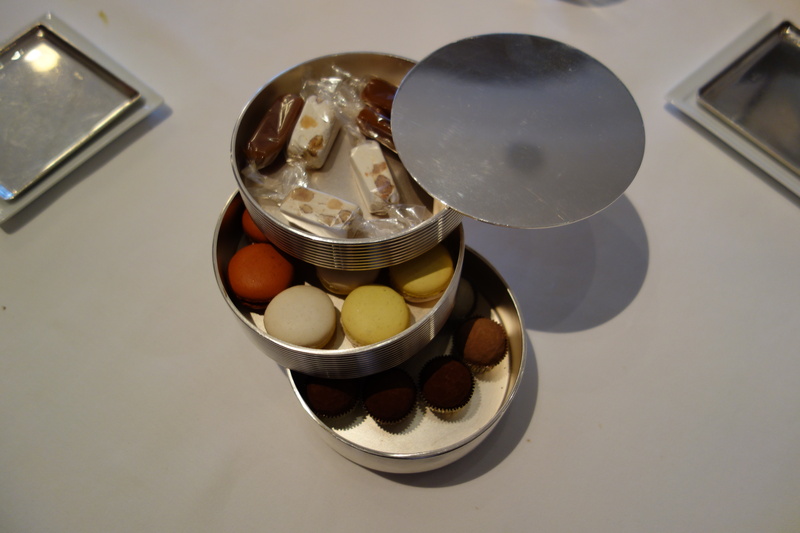 I haven’t been to Per Se in months and months and dream about my new visit. But EMP is pretty hard to compete with, it’s true. Thanks for commenting Katie! 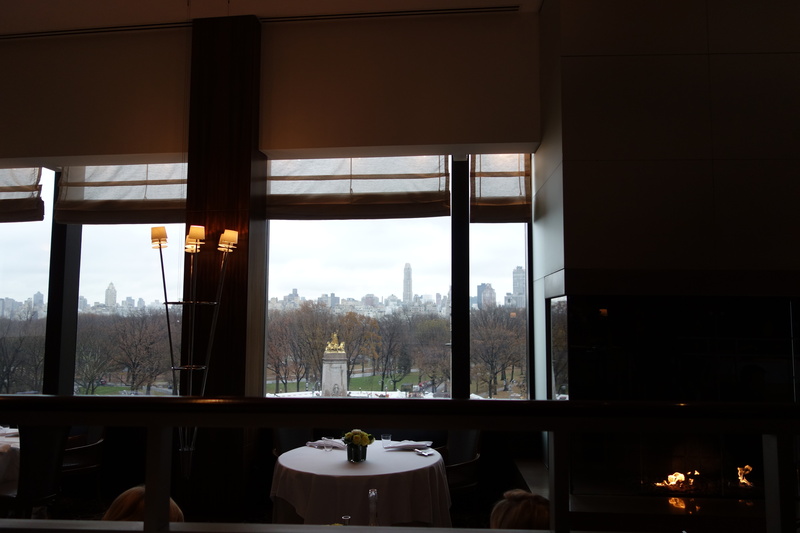 Yes, I’ve noticed you like Per Se over EMP too – my thinking is that EMP wows you with the New York special on the first visit, repeat visits may fail to recapture that magic. 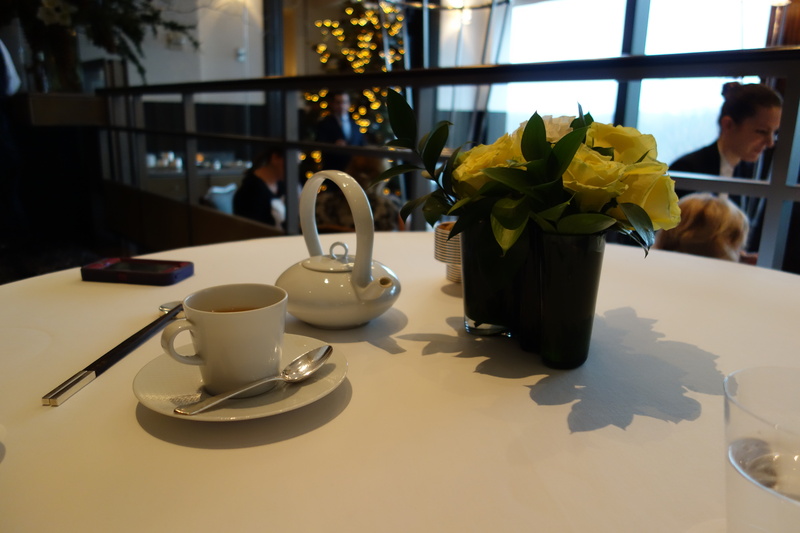 Per Se certainly had a smidgen more accomplished cooking this time round, but my issue was more with the price point of the extended tasting menu this time round. 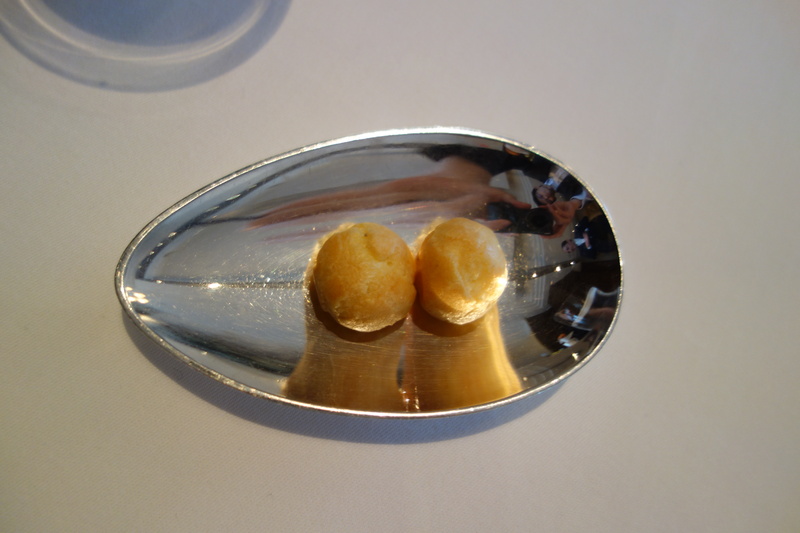 Some of my friends working in New York restaurants have also mentioned being slightly disappointed by Per Se as well – perhaps it is a function of the expectations we bring into the meal – Per Se’s conservatism was not something we expected too much. 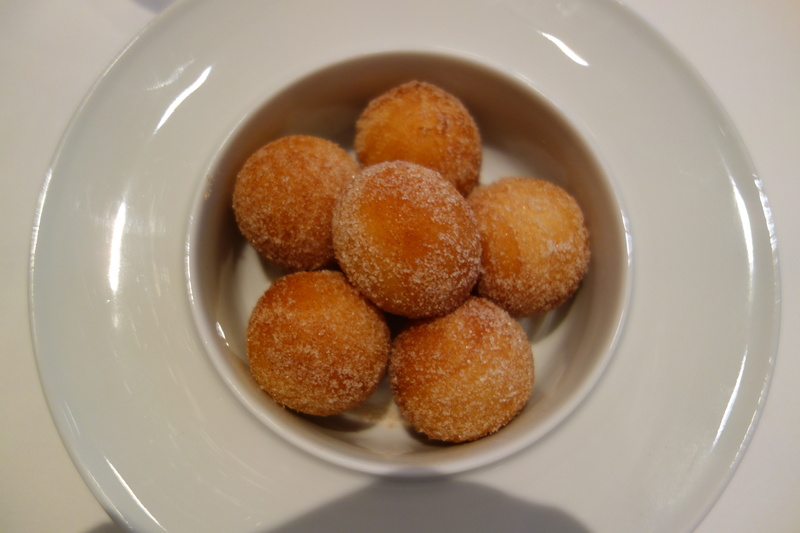 But I think you are more experienced, and able to comment on their menus – having been to each multiple times!